We're approaching the end of June and we've had some pretty cold weather for what is supposed to be Summer. Yesterday and today have been lovely however, so could we please have Summer now? My hardy annuals are now nearly all in flower and I'm really pleased with the varieties that I've chosen to grow this year. New for me this year are Amberboa muricata 'Sweet Sultan' with pale pink shaggy cornflower type flowers, the tiny white annual Lupin 'Snow Pixie' with delicate white spires of flowers on short stems and the amazing Malope trifida 'Vulcan' which has large magenta trumpet flowers with lime-green centres. My blue and dark red Cornflowers are producing masses of flowers. They are so easy to grow and reliable and really do keep on flowering for a couple of months the more you pick them. My Larkspur are looking really healthy and are in bud but not flowering quite yet. 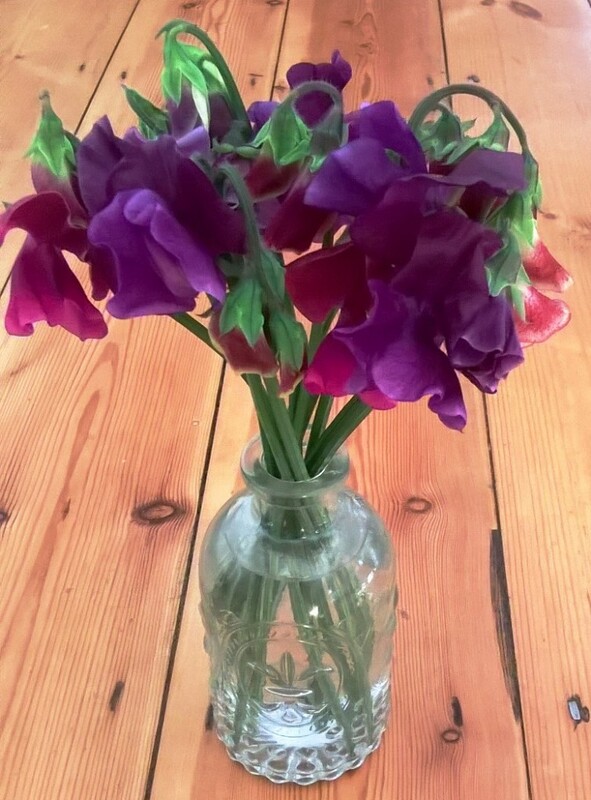 My Sweet Peas are looking really lush climbing up a frame of birch branches and I love the rich colours of the flowers. 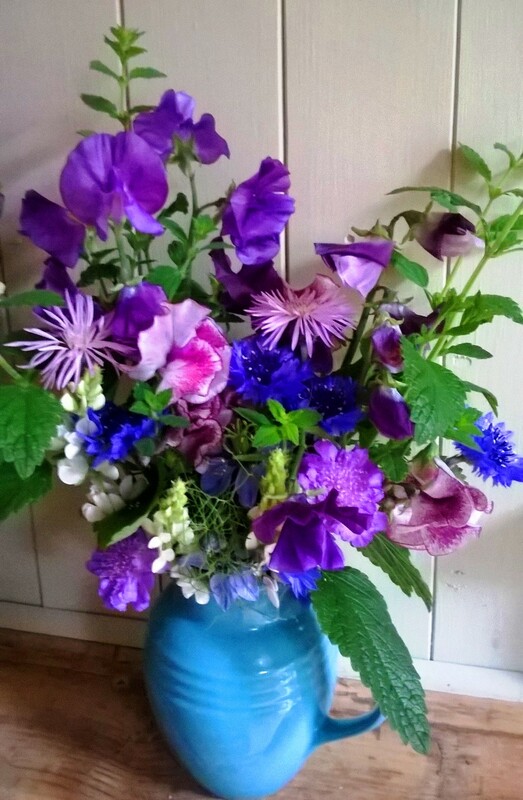 I've grown 'King Size Navy Blue' (a very dark purple - I'm not sure why seed producers are obsessed with producing blue varieties of flowers which are always, always not blue at all! ), 'Matucana' which are bi-coloured - crimson and violet and 'Wiltshire Ripple' which are frilled, white flowers, splashed and streaked with deep claret. All three varieties have a lovely fragrance. 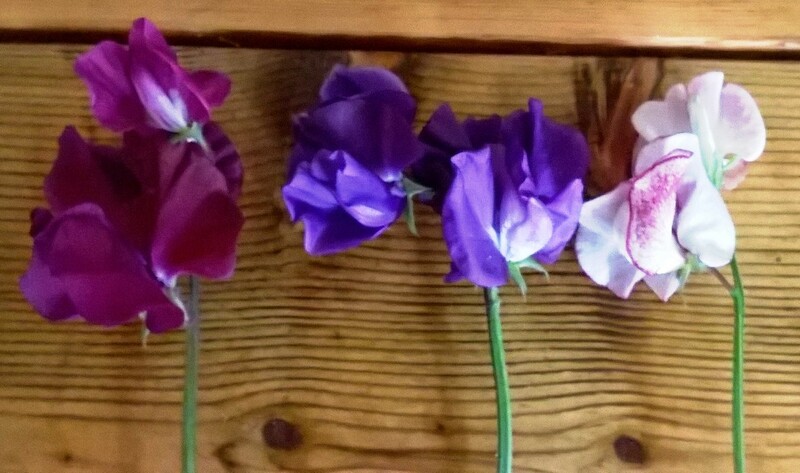 Sweet peas have one of the very best scents of any flower. Yesterday, I took a sneaky day off and visited the gardens at Helmingham Hall in Suffolk and walked through a lovely rusted metal pergola swathed in gorgeous sweet peas which smelt heavenly. I don't have space for more than 3-4 varieties but it is fun to grow something different each year. Unfortunately, I've also suffered some losses in my cutting beds. Virtually all of my Bupleurum, Ammi majus and Orlaya grandiflora plants, which started with healthy growth have slowly, one by one, turned brown and have died off. I'm not sure what has happened to them but it may be the unseasonably cold weather or some kind of pest or disease in the soil. All my other annuals in the same beds are flourishing so it's very strange and not something I've encountered before. I have sown some more of each type, which may still have time to flower this season, so I will see if they fare any better. All of these annuals make very good fillers (serving to bulk out a display with non-showy flowers and adding a light, airy feel to a vase). My half-hardy annuals, which were planted out into two beds at the beginning of the month, are slowly increasing in size. These include Didiscus 'Blue Lace', Cosmos 'Click Cranberries' & 'Rubenza' and Zinnias 'Yoga' &'Art Deco'. I'm expecting flowers towards the middle of July (if the weather warms up!). The Cosmos were planted into a bed that previously housed a crop of Tulips. I left them for as long as possible for the foliage to die down but it was still pretty green when I had to take the bulbs up. It's important to let Tulip foliage die down so that all the energy goes back into the bulb for flowers the following year. This being so, I carefully lifted the bulbs with foliage still intact and placed them temporarily in some plastic window boxes with some soil and put them out of sight at the bottom of the garden. Once the foliage had died off, I took the bulbs up again and let them dry out before brushing off any soil and storing in paper bags in a dark cupboard until late Autumn. In the potting shed, I've sown some bi-ennial seeds for plants which I will plant out in September for flowers in early Spring next year. I've gone for the purple form of Sweet Rocket (it also comes in white) and two varieties of Sweet William - 'Single Mixed' (a mix of whites, pinks and dark red) and 'Sooty' which is a dark maroon chocolate colour. Other biennials you could sow now include Honesty and Wallflowers. In terms of maintenance, I am tying in new growth on the tall annuals, such as Larkspur, Cosmos and the Sweet Peas, to their supports. Once a week, I give the cutting beds a really good soak with the hose. A good watering once a week is preferable to giving plants a little drink every day which only encourages shallow roots. You really want the plant roots to have to seek out the water further down the soil profile. Once the Dahlias are in flower (buds are just starting to form on my plants), I will give them a weekly feed of seaweed extract. 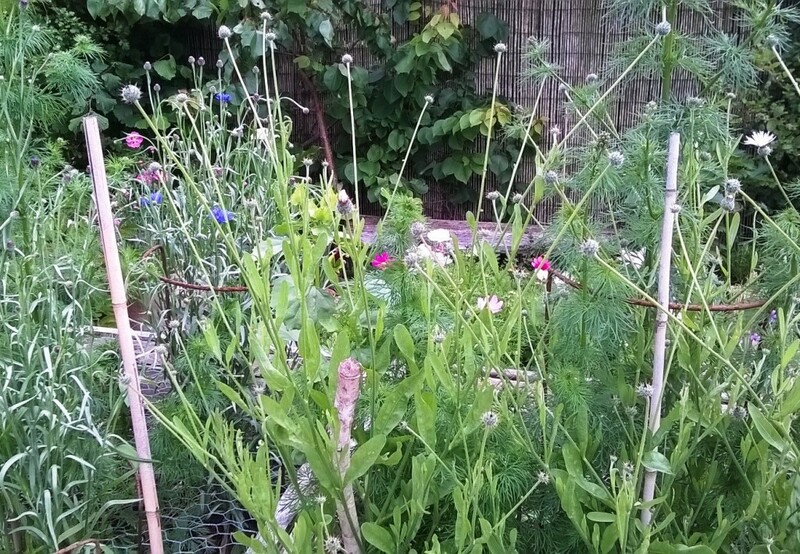 I haven't got a lot of weeds in the raised beds but if a stray one does appear, usually a fennel seedling that has self-seeded from elsewhere in the garden, I will pluck it out. That's it, just ensuring that flowers are picked every few days and not allowed to flower and form seed heads. Seed formation is an annual plant's whole 'raison d'etre' and once it has achieved this, there is no reason to keep producing flowers so pick them regularly and they will flower for months before exhausting themselves. Elsewhere in the garden, I'm continuing to harvest the foliage of Lemon balm and Oregano and cutting flowers of perennial Scabious, Roses, Heuchera and Astrantia. Flowers have just started coming out on my perennial Knautia macedonica which will keep flowering the more it is cut for the next few months. We're nearing the end of British Flowers Week. The campaign, created by New Covent Garden Flower Market, now in its 3rd year, promotes British flowers and foliage and the UK cut flower industry. It's a celebration of seasonal, locally-grown flowers and foliage which aims to "shine a spotlight on the best of British Cut Flowers." Personally, it has seemed like a really long week to me as Rosie, my 3 year old, has been home from nursery with the chicken pox. And very irritable she has been too. However, she has been "helping" in the garden, in between tantrums, pulling up big handfuls of Ox-eye daisies by the roots to make a 'rangement', as she calls it. British cut flowers are enjoying a resurgence in demand with people appreciating the value of locally-grown, freshly cut flowers, mirroring the demand for locally produced food. By buying British flowers you will be supporting local industry and encouraging wildlife and biodiversity. More than 80% of flowers bought in the UK are imported. The average supermarket bouquet may have travelled 20,000-25,000 km before arriving in your living room. Large flower farms in South America and Africa grow flowers on a vast scale to supply the demand for cheap flowers across the world all through the year. It may seem that we now have a huge choice of flowers, but just as fruit and vegetables are grown for uniformity and shelf-life, the same applies to flowers. You won't find flowers with anything other than straight stems, chemicals like silver nitrate will have been used to increase flower life and natural scent will have all but vanished. How can you find these British-grown flowers and foliage? 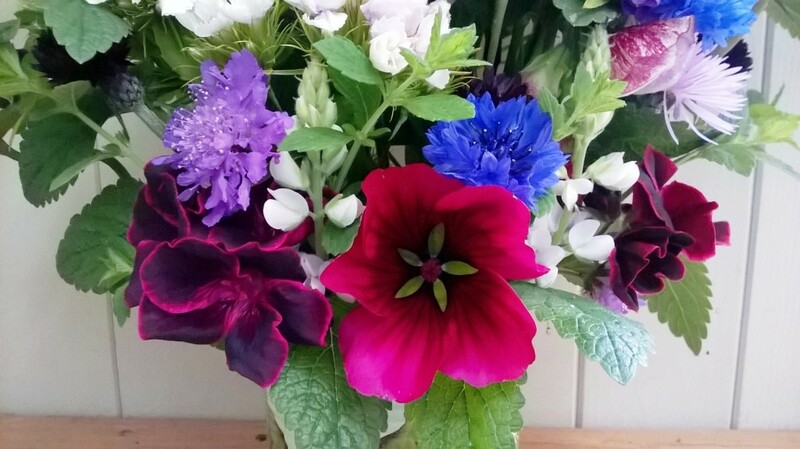 Just look for independent flower shops across the country or it is possible to buy direct from an artisan flower grower though the Flowers from the Farm website. If you visit the British Flowers Week website, you can download a free wall planner which lists the large variety of British-grown flowers available throughout the year, showing what you can expect to be available each month. You may be surprised at the array on offer. Flowers include Agapanthus, Bluebells, Cornflowers, Lilies, Lupins, Sedums, Poppies, Tulips and Violets. 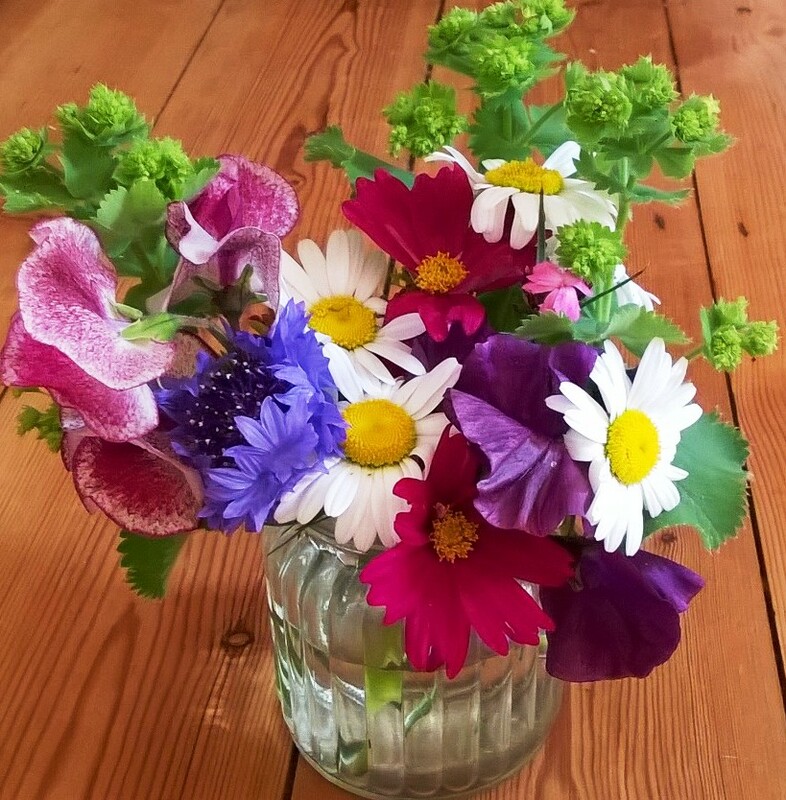 If you are really inspired and want to display something a little different in your vases then growing your own flowers is hugely rewarding and inspiring. A little word of warning - you may become addicted! Well, it almost feels like summer has arrived in Norfolk - if you ignore the threat of frost earlier in the week, and the cold wind today! I've cut my first annual bloom - a gorgeous little Lupin called 'Snow Pixie'. The buds on my annuals are just waiting to open. Once they do, I will be cutting flowers from now until the first frosts. However, it will be a week or so until the annuals are fully up to speed and appearing en-masse in my vases. In the meantime, there are plenty of flowering perennials to pick. 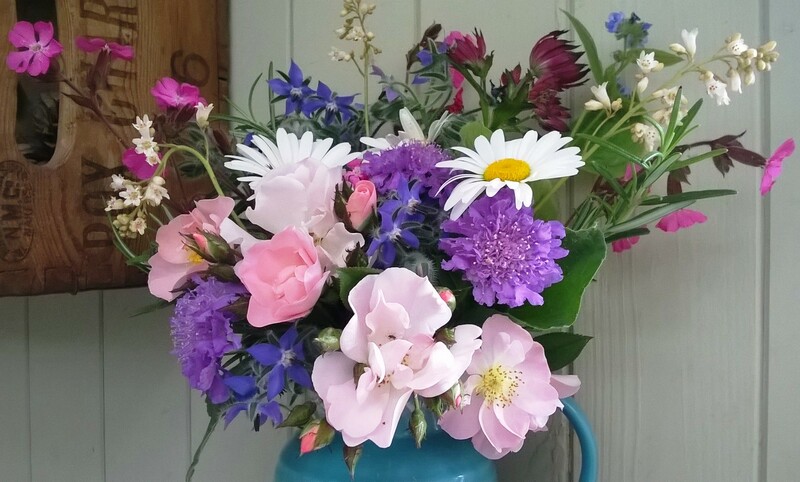 June Flowers - Red Campion, Heuchera, Astrantia, Scabious, Ox-eye Daisies, Borage, Rosemary and Roses. I've revamped my mixed borders this year to expand the number of perennials that produce cut flowers, while maximising year-round interest. When picking perennial flowers, unless you have the space for a dedicated perennial cutting bed where you can treat the plants as a flower crop (which I don't), then you will need to be picking flowers here and there from plants to ensure that you still have a good display outside. 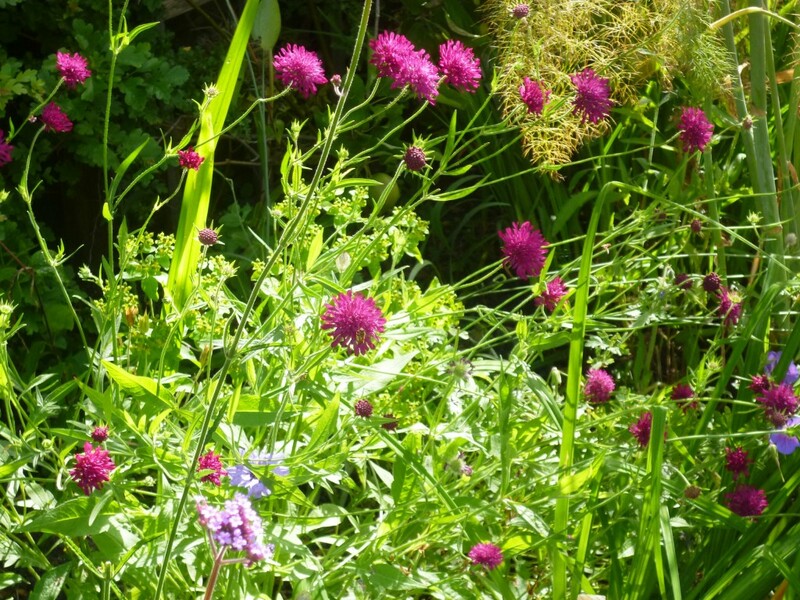 Most perennials, like Knautia macedonica, benefit from dead-heading so the action of cutting flowers will stimulate more to appear. I have three Knautias that produce so many flowers that I can pick plenty of flowers from them without stripping them of flowers. 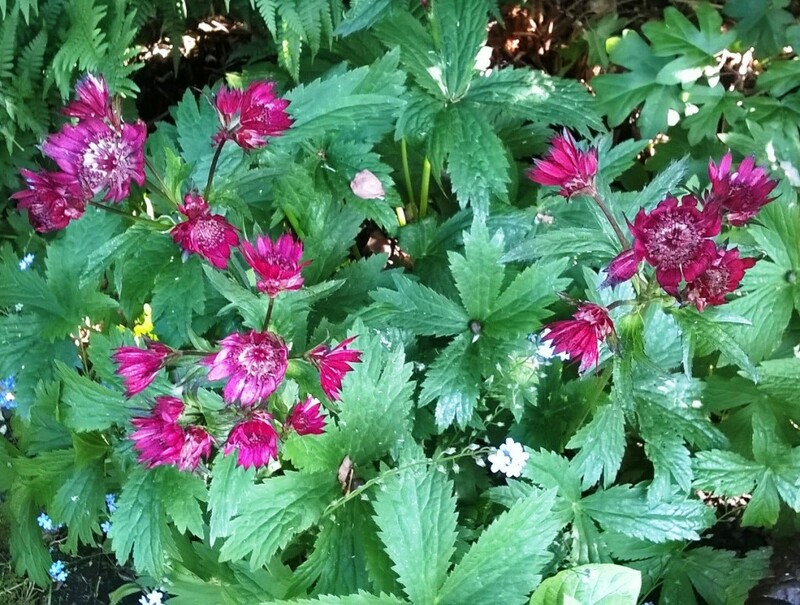 I find that some perennials, like Astrantia, are slow to replace cut flowers. I will only snip a few flower stems on such plants so that there are still flowers for the garden. Just 3-5 stems of a few perennials, supplemented with foliage from shrubs and perhaps some herbs will create a lovely vase-full. The key is to grow more than one of each type of perennial. Planting in loose groups of 3 or 5 also looks very natural in a border and creates a sense of repetition and balance. Astrantia, Masterwort or Hattie's Pincushion. The flowers of Astrantia are unusual in that they are formed by a group of tightly packed florets, backed by petal-like bracts. They flower from June to August and have serrated, dark green leaves. I have a pinky-red variety called 'Ruby Wedding' and 'Alba', a white form. They grow well in either full sun or partial shade. This is a long-lasting flower once cut and also lasts well out of water so would make a good addition to the buttonholes if you are thinking of growing your own wedding flowers. 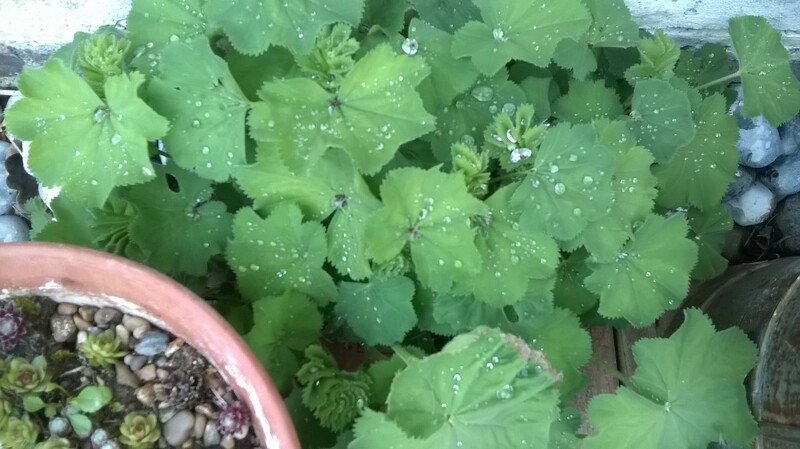 Alchemilla mollis, Lady's Mantle. This wonderful plant has scalloped, bright green leaves which catch droplets of rain water. From June to September, it produces a frothy haze of tiny, chartreuse yellow flowers. It is ideal edging paths. Superb for foliage and as a filler in arrangements. I have a few patches throughout the garden, in both sun and shade. The shady ones will flower later in the season which is handy to prolong the cutting period. Leucanthemum vulgare, Ox-eye Daisy. I really should have included this in a previous article about flowers to cut in May as I have been cutting them for about a month now. They are lovely large daisy flowers and add a meadow-like, informal feel to a jug of flowers. They are our largest native species of daisy and are commonly seen on road-side verges. A campaign run by Plantlife is trying to protect rural road verges which are a vital refuge for wild flowers driven out of our farmland. Knautia macedonica. Dark crimson, pincushion-like flowers are borne on long, wiry stems. This tall perennial is great for the back of a border and just keeps flowering all through the summer. The more you cut the flowers, the more flowers will form, making it the perfect perennial for a cutting garden. Dianthus carthusianorum, Carthusian pink. Good for growing in pots. This is a tall pink with small, single, magenta flowers above narrow, grassy green foliage. Deadheading / picking flowers regularly will help encourage more flowers. Silene dioica, Red Campion. This perennial has carmine-pink flowers and is often seen growing along roads and hedges. It's an important plant for wildlife, its nectar attracts hoverflies, butterflies and long-tongued bumble-bees. It responds well to picking and flowers abundantly and its bright flowers really liven up a flower display. Scabiosa caucasica, Pincushion Flower. I grow annual Scabious too, but flowering before then is my lovely pale purple, perennial Scabious. The more flowers you pick, the more will come. I grow this in a pot but it would be equally good in a border. Huechera, Alum root or Coral bells. I love Heucheras as they come in a range of foliage colours, tolerate sun and shade and I find that they are pretty much evergreen in my garden. The leaves start to look a bit tired by February so I cut them down and they spring back up with fresh growth. They produce tall, slender flower spikes with bell-shaped flowers, hence the common name, Coral bells. Other perennials flowering in June: Lupins, Osteospermum, Peonies and Valerian.